"'After the Spate' (F Leslie, Edinboro', Bronze Medal). An effective bit of glen scenery. 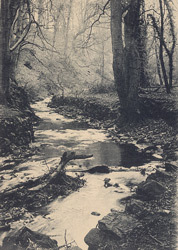 The original was a very fine platinotype; both negative and print show admirable technique. Pictorially, the foreground is rather week, and would have been improved by judicious trimming. The triangular mass of rock on the right tends to weaken the compostition. The picture was taken with a rapid rectilinear lens, and two seconds' exposure in a fairly good light was give to a Castle plate."